The seventh-ranked University of Florida women’s tennis team passed its final test before next weekend’s national team tournament, blanking South Florida, 7-0, on Monday at Linder Stadium at Ring Tennis Complex. Florida improved to 6-0 this season after Monday’s convincing win over the Bulls (2-2), sweeping the doubles competition, before capturing five of the first six singles matches in straight sets. UF freshman Caroline Hitimana was the first to post a singles victory, taking down Natalia Guevara, 6-1, 6-1, in 56 minutes. Fellow rookie Allie Will continued her impressive season, as she earned a 6-2, 6-0, win in 62 minutes against No. 52 Ecaterina Vasenina on court No. 2. 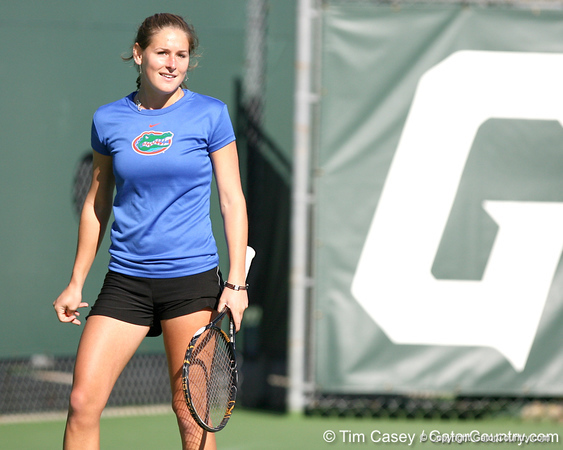 Florida senior Anastasia Revzina defeated Janette Bejlkova 6-3, 6-4 at the No. 4 position to clinch the dual match for Florida. Freshman Lauren Embree earned an impressive 6-3, 6-2 victory against No. 77 Irene Rehberger on the showcase court. Senior Marrit Boonstra clocked in her 6-1, 6-3 decision over Melissa Koning. Sophomore Claire Bartlett defeated Natalie Guevara, 7-5, 4-6, 1-0 (11-9) at the No. 6 position to provide the team sweep. Florida won the doubles point, as it has done in every dual match this season, capturing all three doubles matches to take the 1-0 lead in the team scoring. Marrit Boonstra and Allie Will, ranked No. 26 nationally, upset eighth-ranked Melissa Koning and Irene Rehberger, 8-5, to post their second win against a top-10 opponent and improve to 6-0. The Gator No. 2 pair of Lauren Embree and Anastasia Revzina posted a 8-3 victory over Janette Bejlkova and Ecaterina Vasenina. Caroline Hitimana and Joanna Mather provided the clinching doubles-point win with their 8-4 victory against Natalia Guevara and Allyn Mueller.